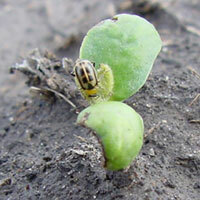 Overwintering adults feed on emerging seedlings. 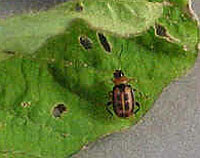 Their eggs become the first generation of bean leaf beetles. Click on image to view a larger version. Photo: University of Illinois. 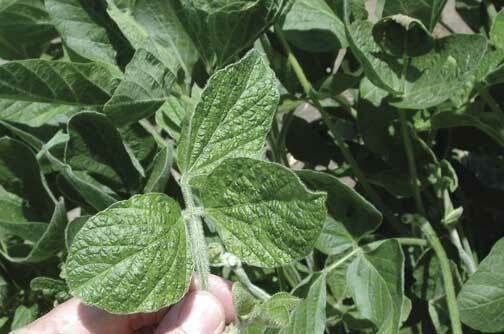 Bean pod mottle is a viral disease of soybean, snap bean and other legumes caused by the bean pod mottle virus (BPMV). Like many plant viruses, BPMV is spread by an insect. In the North Central region, the most important insect vector is the bean leaf beetle, Cerotoma trifurcata. 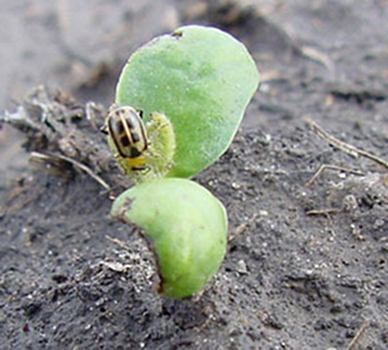 The bean leaf beetle feeds on soybeans or other legumes infected with the virus and transmits the virus particles to the next plant on which it feeds. Although the level of virus transmission by overwintered beetles is low, beetle populations in the upper Midwest are at historically high levels, and thus even low rates of transmission through beetles may be important. In a two-year study reported in the journal Plant Disease, bean leaf beetle population densities were linearly related to BPMV incidence in both years, indicating that BPMV epidemics were greatly influenced by the bean leaf beetle. Similarly, the high beetle populations may make low rates of transmission through seed (less than 0.1%) important in the development of virus epidemics. Finding out how BPMV spreads is an active area of research. It is possible that all three sources of the virus play important roles, depending on the specific location and environment. Quantifying the Within-Field Temporal and Spatial Dynamics of Bean pod mottle virus in Soybean. Infection by BPMV decreases pod formation and reduces seed size, weight, and number. 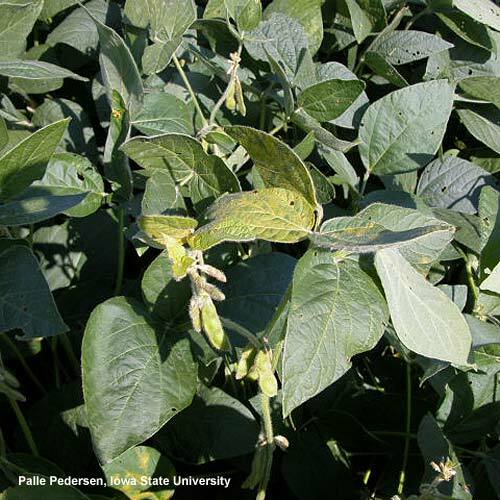 Infection with more than one virus, such as soybean mosaic virus, is not uncommon, and yield loss can be much greater in mixed infections than either virus alone. 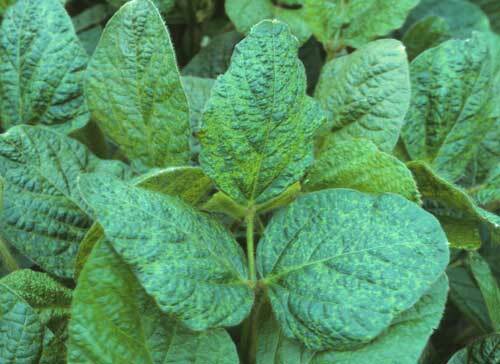 Virus infections can cause seed coat mottling, a problematic symptom for soybean growers and the soybean industry. A study in the journal Plant Disease reported that plants infected with BPMV and SMV, alone or in combination, produced seed coat mottling, whereas noninoculated plants produced little or no mottled seed. BPMV and SMV inoculated on the same plants did not always result in higher percentages of mottled seed compared with BPMV or SMV alone. 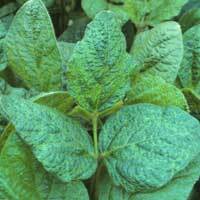 There was significant virus, line, and virus-line interaction for seed coat mottling. BPMV can also predispose the plant to infection of seed by the fungal pathogen Phomopsis, which can lower seed germination and seedling vigor. Mottled seed can be a sign of poor seed quality, resulting in financial penalties to producers. Refernce: Occurrence of seed coat mottling in soybean plants inoculated with Bean pod mottle virus and Soybean mosaic virus. Plant Disiease 87:1333-1336. Scouting for signs of virus infection. Check for leaf symptoms on young leaves, which show symptoms more readily than older leaves. Scout for plant symptoms of virus during periods of rapid growth and cool temperatures. Symptoms will be most apparant under these conditions than during dry, hot weather. Scouting for bean leaf beetles. Scout for the first-generation peak in late V or early R growth stage - around early July. A typical leaf symptom of BPMV is a yellow and green blotchy appearance called leaf mottle. Young leaves show symptoms more severely than older leaves, sometimes with a raised or blistered appearance and distortion of leaves in the upper canopy. Symptoms are most obvious during periods of rapid growth and cool temperatures. Sometimes symptoms resemble injury from herbicide drift. Symptoms go into remission during hot weather and later during the reproductive stages. Accurate diagnosis is the key to virus management. 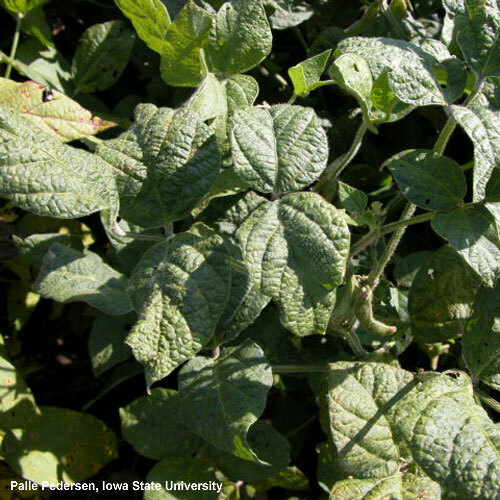 Soybean viruses are spread by different vectors and have very different management requirements. Therefore, it's important to know which viruses are most prevalent. Unfortunately, the symptoms caused by BPMV are similar to those caused by other viruses. This makes it difficult to diagnose BPMV and most other viruses based on symptoms alone. Serological tests can accurately detect and distinguish among suspected viruses. Most diagnostic clinics in the North Central region are able to perform these tests. Contact your state university diagnostic clinic. Although bean leaf beetles transmit BPMV all season long, soybeans are most affected when infection occurs in the seedling stage. time soybean planting to avoid the highest populations of the bean leaf beetle. This can be done using a degree day model. The method is described in detail in the article Predicting first-generation bean leaf beetles. 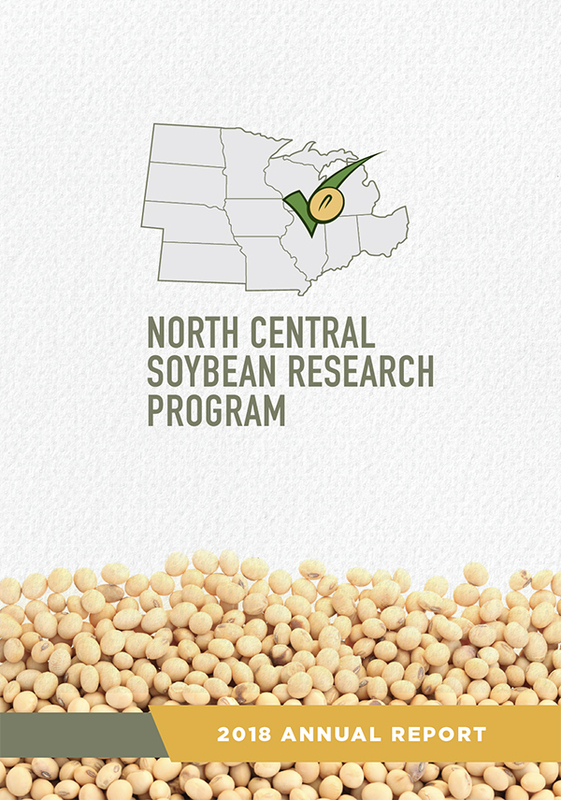 The development of virus-resistant or tolerant soybean varieties is an active area of research. Soybean varieties have been observed to differ in their tolerance to BPMV, and some progress has been made in quantifying those differences. 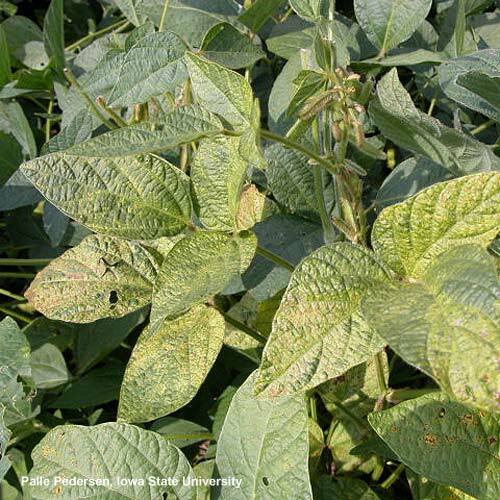 BPMV resistance has been detected in a closely related wild soybean species, Glycine soja. A recent two-year study looked at BPMV-infection in soybean genotypes that included two insect-feeding-susceptible genotypes, two insect-feeding-resistant, semidwarf genotypes, and an insect-feeding-susceptible, semidwarf genotype. Although the results indicate that BPMV infection varied by genotype, they do not support the hypothesis that insect-feeding resistance is sufficient to reduce the incidence and spread of BPMV. Researchers at Iowa State University have constructed a flowchart to help growers with insect/virus management decisions. The flowchart is a dynamic, two-pronged decision guide based on field history. If bean pod mottle virus has not been present in your fields, then the only reason to consider early-season bean leaf beetle management is if populations reach extremely high levels (more than 2.5 beetles per plant) and economic feeding damage can occur. Insecticide treatment will not be cost-effective if the virus is not present. 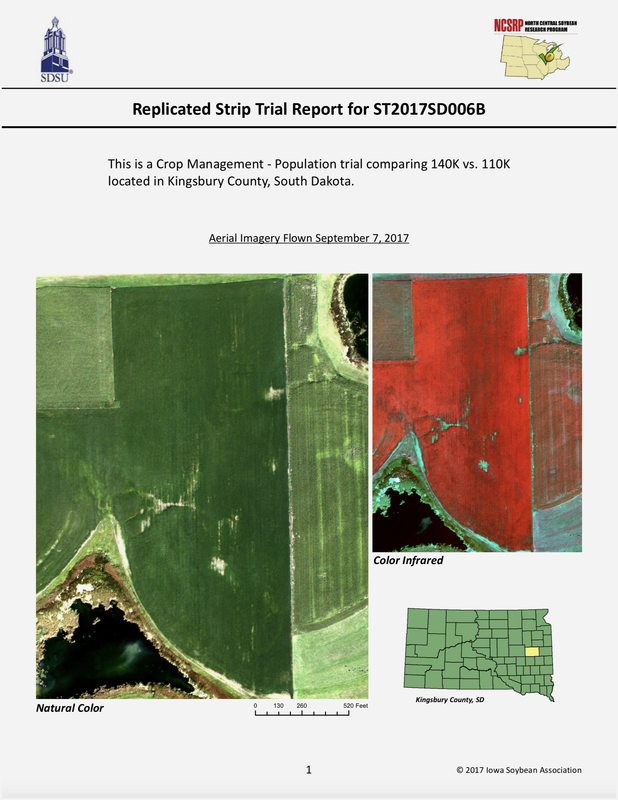 Right now, most of the information for predicting economically important variables for beetle damage is available. 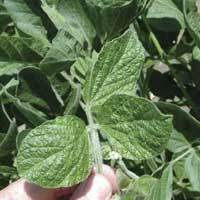 More information is still needed regarding bean pod mottle virus. As more research is conducted, the results can be added to the decision guide.